Notes administrator has a facility to limit the quota (maximum size) of a 1 V notes mail. But the facility of Notes mail is such that once the quota limit is reached, the user is notified that the user has reached the limit of his / her quota usage but no mail is prevented from being sent by the user. However, the user is prevented from saving a copy of the mail being sent in the sent folder. At the same time there is no facility by which the user comes to know what percentage of his quota limit has ones mail file occupied. The objective of this document is to restrict the sending and saving of Notes mail when the quota of a mail file is over and providing the user with a facility to view the percentage usage of Notes mail quota as soon as the user logs into his / her mail file (like the bar shown in our very own yahoo! Mailbox). Machines that provide TCP services are often susceptible to various types of Denial of service (DoS) attacks from external hosts on the network. 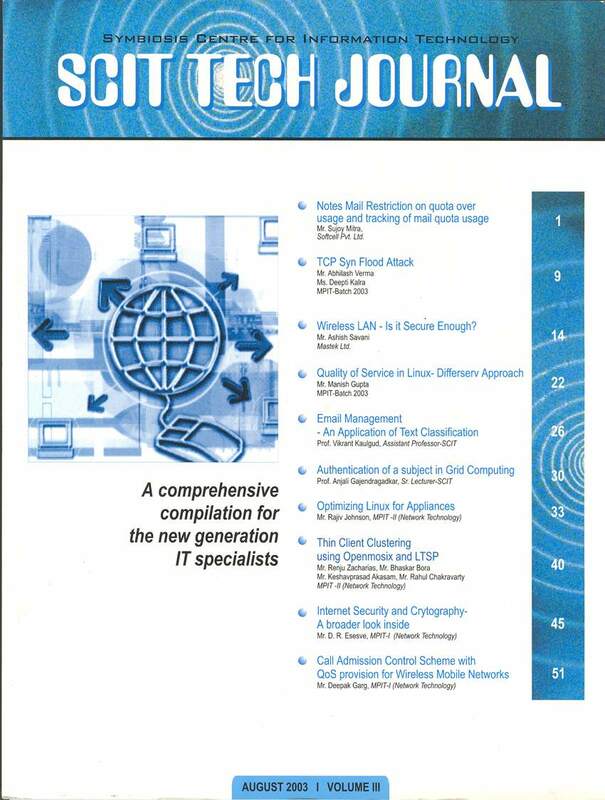 In 2000, DoS attacks have emerged as the big threat to globally linked networks. Injust the few months since their first appearance, DoS attacks have already taken some of the most popular e-commerce sites, like Yahoo, e-bay, Amazon etc. off-line for several hours, causing enormous losses and repair costs. Launching a DoS attack is trivial, but detection and response is painfully slow and often a manual process. DoS attacks are typically aimed at servers connected to the Internet with the intent of degrading or disabling the systems to the extent that the services become unavailable to legitimate users. Instead of attempting to hack into the target systems to access confidential data, DoS attacks focus on overwhelming the systems with bogus and / or defective traffic that undermines their ability to function normally. TCP SYN flood is one of such attacks. This paper introduces various types of DoS attacks in brief, TCP SYN Flood attack, its effects, its countermeasures and their impact on the system, impacts on the system when the SYN attack defense measures are turned on. The platform taken for experiment is Red Hat Linux 7 with kernel version 2.2.16 and TCP / IP version 1.0, which is tested against the actual SYN flood. This is a research paper and is result of experiment conducted in our college lab, it is requested not to consider the experiments results as facts. Wireless LAN Is It Secure Enough? Wireless Networks are increasingly becoming an important adjunct to the more traditional wired networks, to satisfy the needs for mobility, relocation, ad hoc connectivity, and coverage of locations inaccessible for wiring. But certain issues like lack of maturity in the technology and lack of standards make wireless networks still far cry as an acceptable complete solution when compared to existing wired networks. This paper brings an insight of issues pertaining to the security and the deployment concerns along with the government regulations in India, and shows how it forms a bottleneck in the pace development of Wireless Networks, specifically WLANs. The ever-growing traffic over the internet has propelled the .1. need for guaranteed service to the end users. This certainly involves prioritization of traffic. The simple idea being dividing the traffic into different categories and allocating each category, a certain level of service. The service applied to a particular traffic is decided based on the criticality of it. The IETF proposed Differentiated Services(Diffserv) architecture provides with such capabilities.Linux has a built-in support for traffic control and can prioritize and schedule incoming / outgoing packets. This paper focuses on the concept ofDiffserv and its support in Linux. Text classification is the process of categorizing the input text document into one or more categories depending on the presence of certain features in the text. Text classification can be done manually by a set of domain experts. However, with the deluge of textual information in the form of emails, word processed documents, web content etc., it is necessary to use automated methods to perform text classification. Text classification often is interdisciplinary field comprising of Information Retrieval (lR), Machine Learning (ML), Rule-based systems and Agent environments. Lately, text classification has found increased applications in the areas of security and productivity applications. Spam control, intrusion detection, content filtering are just some of the areas where text classification methods have been adapted and used. In the domain of productivity applications, email management has probably benefited the most from text classification methods. In this paper, we discuss the text classification applications in email management. Security and protection deal with the control of unauthorized use and access to resource. One of the main reasons for security violation is unauthorized access to resources. With the Grid technology, which deals with sharing of resources, across individually administered domains, one needs to enforce new security mechanism with special security techniques in it. This paper deals with how resources can be accessed in Grid computing with proper permissions by an authenticated users or processes. And also discusses how a modified implementation of traditional Access Matrix Model can help in addressing those issues. Appliances are becoming popular in provisioning of network services such firewalls, storage solutions, IDS etc. Linux with its inherent modularity and robustness is a good choice for appliance development. In this paper we survey methods to righ-size Linux kernel to make it suitable for use in appliances. These methods were used in practice during the development of a single-floppy-based firewall appliance on Linux kernel 2.4. Clustering is a popular and economical solution for solving computational challenges faster. Our experiment integrates clustering of computers with thin-client technology. Our motivation was the need for putting to use the un utilized processing power of computers in the network. This involved evaluating available thin-client and clustering solutions. For this purpose, the labs were outfitted with traditional PCs converted to thin-clientworkstations, and connected to dedicated servers located within the labs. We choose LTSP software for implementing thin-clients as it could use existing hardware. Openmosix could facilitate clustering on these thin client machines without modifying the programs that ran on the system. We describe howhe two technologies were integrated and examine the performance gains. The modern world is a real global village; it is getting smaller every day. We have a myriad of electronic gizmos that connect us to anyone or anything we want. A greater development in the same path is the Internet, a repository of never-ending information on any topic under the sun. The most important thing while sharing information is security of the data. With data worth billions being exchanged, security becomes the key word. This paper discusses the different security mechanisms, their pros and cons. Entire discussion about each and every technology of the same is beyond the scope of the paper. THE success of future generations of wireless mobile networks depends largely on the QoS provisioning and the Call Admission Control Scheme. The CAC scheme provides the users with access to wireless networks and deals with an important issue of congestion. The user mobility makes it imperative to ensure QoS provisioning and Call Admission Control Scheme leading to QoS guarantee. In this paper the scheme has been developed and analyzed based on assumptions that are more realistic than existing proposals. The analyzed scheme considers partitioned based cells for the bandwidth reservation. In order to ensure efficient bandwidth utilization we propose to ensure the bandwidth capacity of cells based on the arrival ratio of hosts in that cells. Also, the bandwidth reservation is based on the mobility rate of the mobile users coming to that cell. Our mobility adaptive scheme considers the average number of users coming to a cell in a unit period of time. We have analyzed the performance of these schemes through extensive simulation studies. The results appear promlsmg.